1. Skin and mucus membrane as reservoirs of Bacterium anitratum and Mima polymorpha. 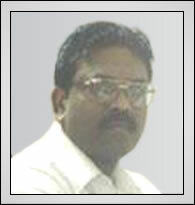 Venkataramani,T.K., T.Sundararaj, H.N. Madhavan, and K.B.Sharma. 2. Mycotic flora of normal conjunctiva. 3. Mycological studies in keratitis. Dasgupta,L.R.,A.K.Gupta,B.Ghosh ray,T.Sundararaj, S.Ramamoorthy and P.A.Lamba. Actinomycetes from mycetomas and other cases around Pondicherry. 5. Pyogenic meningitis caused by Salmonella typhimurium. 6. Cell mediated immunity to Vibrio cholerae with ribonucleic acid protein fractions of V.cholerae L form lysates. 7. Cell mediated immunity in experimental Nocardia asteroides infection. 10. Cell mediated immunity in experimental Nocardia asteroides infection. A thesis by T.Sundararaj submitted for Ph.D degree of University of Madras in August 1977. 11. Childhood diarrhoea and its association with entero pathogenic Esh.coli. 12. Relationship of macrophages to cell mediated immunity in experimental Nocardia asteroides infection. 13. Widal test as a diagnostic aid: a reappraisal. 14. Serological evidence of leptospirosis in cattle. Proceedings of the Fourth National Congress of Medical Microbiologists.Vol.IV:1980. 15. A comparative evaluation of two proteocine typing schemes. 16. Cell mediated immunity in human amoebiasis. Sundararj.T.,R.S.Rao, Solomon Suniti and S.Subramanian. 17. Cell mediated immune response in human cases of Rhinosporidiosis. Citravel,V., T.Sundararaj, S.Subramanian,M.Kumaresan and S.Kunjithapadam. 18. A study of drug resistance among Salmonella typhi and Salmonella paratyphi A in an endemic area, 1977-78. Rao,R.S., T.Sundararaj, S.Subramanian,V.Shankar,S.A.N.Murthy And S.C.Kapoor. 19. Cell mediated immunity to Salmonella typhi in normal population of Madras(India) an endemic area for typhoid fever. 20. Studies on humoral and cell mediated immune responses to leptospires among house rats . 24. Cell mediated immunity as indicated by leukocyte migration inhibition test to Entamoeba histolytica in normal population. Sundararaj.T., Suniti Solomon, A.Sundararaj, and S.Subramanian. 25. Serological evidence of leptospirosis in jaundice and pyrexia of unknown origin. Ratnam., T.Sundararaj, S.P.Thyagarajan, R.s.Rao, N.Madanagopalan, and S.Subramanian. 26. Isolation of leptospires and demonstration of antibodies in human leptospirosis in Madras, India. Thangam Menon., T.Sundararaj, and S.Subramanian. 28. Evidence of leptospiral antibodies among domestic animal in Madras city. 29. A study on the usefulness of counter immuno electrophoresis for the detection of Salmonella typhi antigen in the sera of suspected cases of enteric fever. 30. Transmissible drug resistance in Proteus mirabilis. 31. Quantitative wound biopsy and its relation to graft survival Burns. Thangam Menon, S.Subramanian, T.Sundararaj, R.Murugesan and C.R.Sundararajan. 32. .Kinetics of peripheral blood T.cell number and functions in patients with burns. Thangam Menon, T.Sundararaj, S.Subramanian, R.Murugesan and C.R.Sundararajan. 33. Development of cell mediated immunity in guinea pigs immunized with ribonucleic acid protein fraction of Entamoeba histolytica. 34. Studies on humoral and cell mediated immunity to Toxoplasma gondii in human cases with heart diseases. Sundararaj.T., T.Balasubramanian, A.Manivannan, B.Ilango, A.Sundararaj. 35. Role of bandicoots in human leptospirosis in Madras city. An epidemiological approach. 36. Heterospecific transplantation of human embryonic cortical tissue into the cerebellum of bonet monkey(Macaca radiata). 37. Studies on the cell mediated immune response in mixed parasitic infection with Giardia lamblia and E.histolytica in human cases. 38. Role of humoral and cell mediated immune responses in systemic candidiasis in experimental animals. 39. Experimental study with leptospires in bandicoots(Bandicoota bengalensis). 40. Transplantation of human embryonic cortical tissue into the brain of bonet monkey(Macaca radiata). 41. Transplantation of monkey embryonic cortical tissue into the cerebellum of bonet monkey(Macaca radiata). 42. Introduction to infectious diseases. 43. To identify opportunities and incentives to motivate young scientists in society development programme. Sundararaj,T. In Young scientist s session at science congress. Publn.by Ministry of Science and Technology, Department of Science and Technology, New Delhi. Pp 29-30,1990. 44. Kinetics of peripheral blood leukocyte counts in patients following thermal injuries. 45. Detection of circulating parasite antigen in bancroftian filariasis by counter immunoelectrophoresis using antibodies to SD-4 fraction from heterologous S.digitata. 46. Study on the etiologic agent s of mycotic keratitis. Usha Gnanaselvi,J., Geetha,G, Jeyalakshmi,J,Anandakannan,K, and T.Sundararaj. 47. Bacteriocin typing of Aeromonas species. Sundararaj.T.,Sachin Mani,Selvkumar,N., Kubendran,K and Maruthupandian,S. 48. Studies on the prevalence of Acanthamoeba keratitis in and around Chennai. Fabian.D., Gnanaselvan.J., Anandakannan.K., Niyanthrini.S., Sundararaj.T. Ind.J.Med.Microbiol. 1998: 16(4) 152-153. Fabian.D., Rave Shanker.A.,Alex Anand.E., and Sundararaj.T. Niren Andrew. S., Sundararaj,T., Jayapal V., Subramanian.S. .
51 Fabian Davamani., Srinivasan,M., Celine George., and T.Sundararaj. Incidence of acanthamoeba keratitis in and around Madurai. Convergence. 2002.,4 (1-4) 8-14. 58 Addline Esther Pushparani.D, Vanitharani,.J., Rajkumar.S., Sundararaj.T Government, law and temple bat management. Biodiversity resource management and sustainable use. 297-301.2004.